What’s in your lunch box?? Processed Meat. That’s hot dogs, bacon, sausage, salami. Unless you actually ARE an Oscar Meyer Weiner, your diet should stop being a lot of bologna. Red Meat – I love a great NY Strip and I’ll probably treat myself a few times a year. If you must, go organic, and sorry, but grilling meat is like cooking cancer. Non-organic chicken and non-organic milk. When it comes to milk, eggs and chicken, hormones and antibiotics are just bad news. Even if it takes a tough man to make a tender chicken, chicken skin is not yellow. Ya gotta go organic. GMOs – We’ve heard these letters so many times, they sound kinda fun. Like “Old McDonald had a farm, G.M., G.M.O.! !” – Just keep saying to yourself, “Genetically modified organisms” “Genetically modified organisms”. Picture bacteria, viruses, mad scientists. Soylent Green is people, people. Farm Raised Fish – For some reason, I thought it was good thing that fish were being farmed instead of depopulating fish in their natural habitats. Wrong. Gotta go wild here. And forget swordfish and albacore tuna, unless you like Mercury – and not the Freddy kind. Soda – Regular or diet. It’s chemicals in a can. And stay away from anything citrus flavored (Mountain Dew, Fanta, Fresca) which contains BVO’s – a chemical flame retardant. Damn! I loved a Fresca! Fried Food – I know you really want to stop reading this now. Don’t take away my clam roll, french fries, KFC. And donuts have the pleasure of being fat, sugar AND fried. Dunk that in your Dunkin. High Fructose Corn Syrup. HFCS are actually CCCC’s – chemicals, contaminants, chloralkai, crap. If you’re eating products with HFCS, you’re probably eating like a child. Good and Plenty and I must say goodbye. Sad. Sad. Sad. Kid’s Cereal – It’s sugar in a bowl – floating in bovine growth hormone. I admit I liked my Frosted Flakes in a Jethro Bodine-size bowl. If you really have to eat it, have one serving. That’s about two tablespoons. Microwaved Popcorn – Who knew this was popping poison? Google it yourself. I guess the movie stuff is probably not that great either. And I did like a little movie with my popcorn. 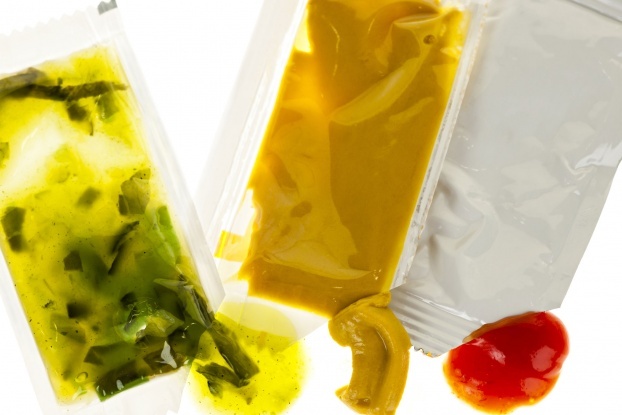 Shelf-stable Condiments – What? Those cute little packets of ketchup, mustard, relish and mayo are bad for us??? They are basically preservatives, additives, artificial flavors, colors, salt and transfats wrapped in plastic with no expiration date. You’ll expire before they will. I’m not saying I liked this blog better when you were sick, I’m not saying that. It feels like you’ve left us only a tasteless mixing bowl filled with legumes, beans and raw rice. OK, OK I’m not that dumb. I did help run an organic food co-op once upon a time, but that’s disappeared into the past over a horizon of pizza, cheeseburgers, doritos – and diet coke.